This little fur ball baby is just too cute! They were so fat, so hairy and so cute that watching them up close for one hour eating breakfast, nursing, romping, swinging, doing acrobatics, play biting each other, chest beating and grooming was total exhilaration to the max. My sedan chair and porter crew. It was fun! 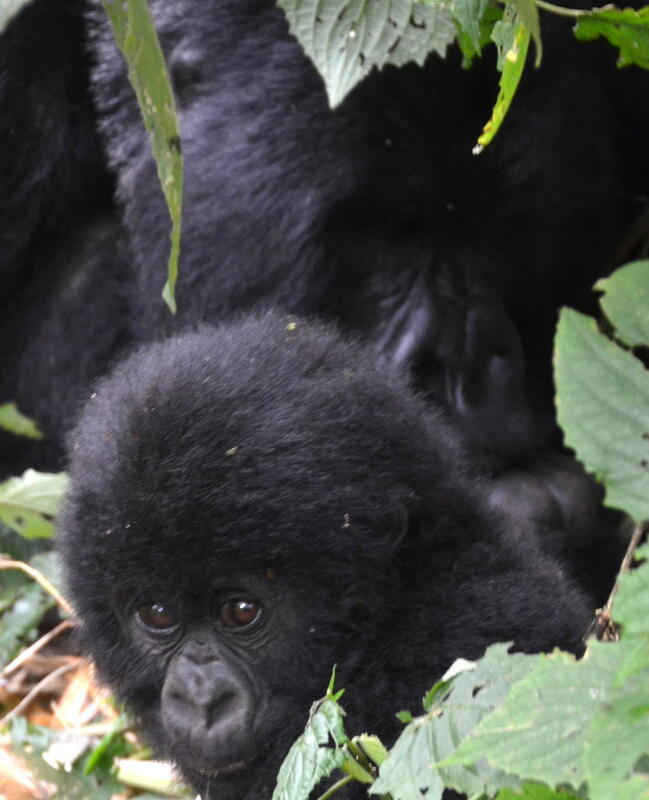 The babies were so precious with a body full of black thick bushy hair and each troop we visited had up to 3 babies in it. 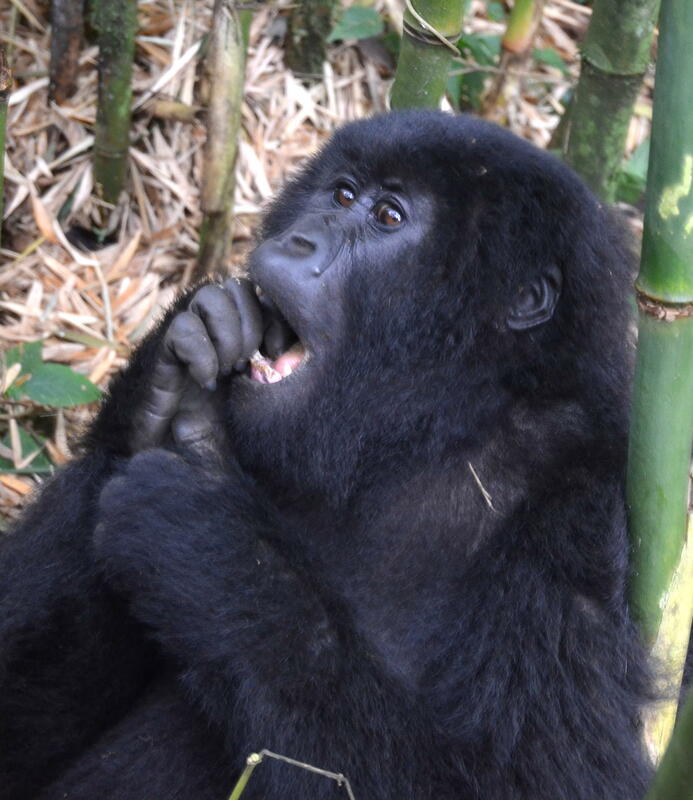 Watching the “R” (Rushegura) group in Bwindi Impenetrable Forest in Uganda and the “K” (Kwitonga) troop in Volcanoes National Park in Rwanda for one hour each was a dream. Preparing the Stretcher Basket for me in the Irish Potato field. Emmy Maseruka, my guide to see the gorillas, coordinated everything for us to make sure all went perfect in Uganda and Rwanda. He now has his own Safari Company at http://www.afrikanwildlife.com and can be reached at emmymaseruka@gmail.com for safaris all over southern Africa. 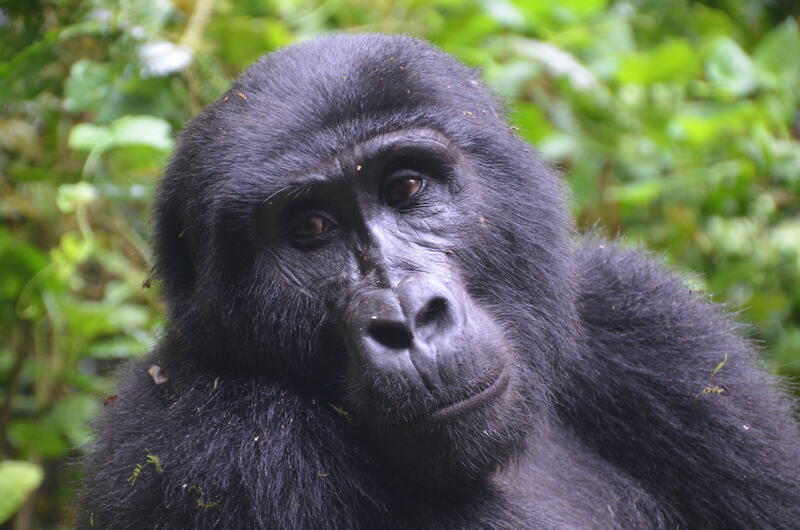 Fortunately for me in both treks, I visited the closest gorilla troop living in the forest because I was carried up the mountain in a Sedan chair in Bwindi Impenetrable Forest. 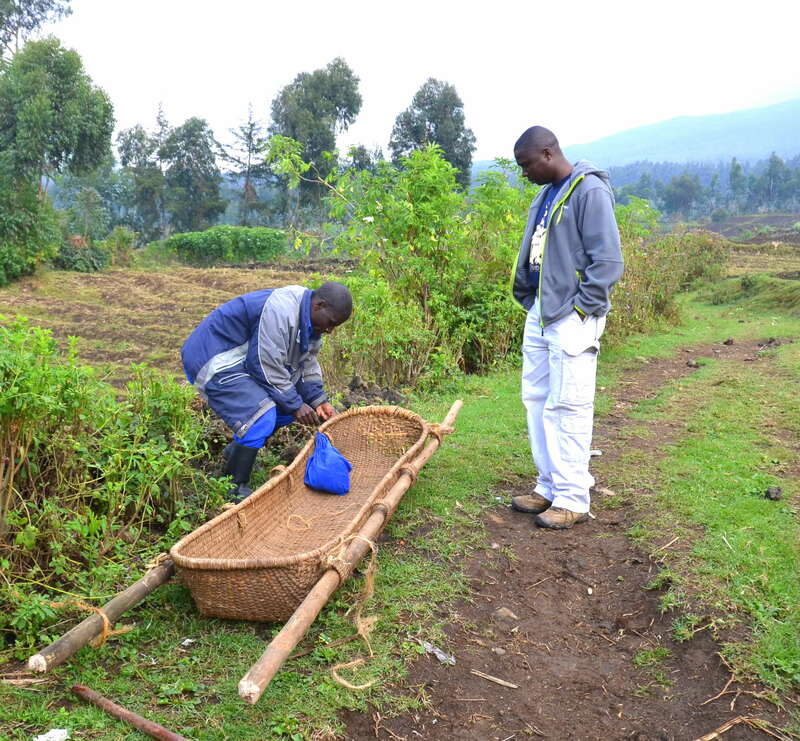 Climbing uphill has always been very difficult for me and the sedan chair was the solution to fulfill my dream of seeing the mountain gorillas in the wild. And the porters didn’t drop me even when going over a creek with a very narrow wooden bridge. 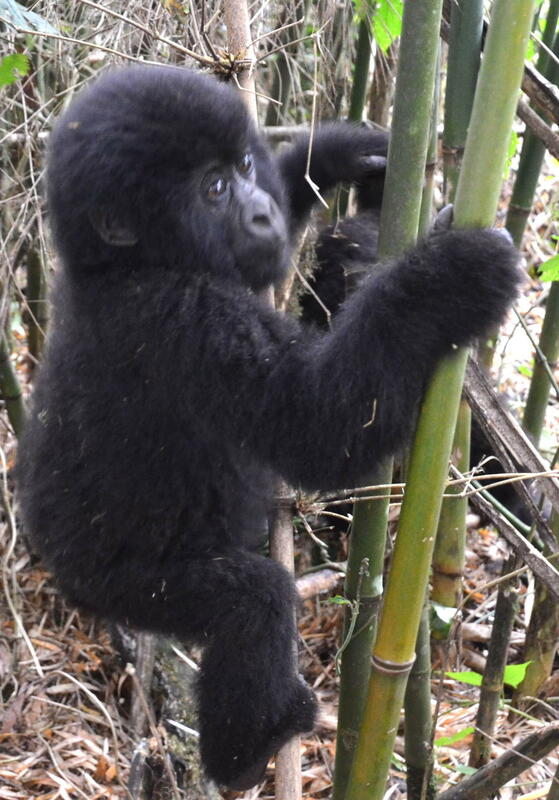 Eight porters, two on each of the 4 support poles carrying the chair rotated often, carrying me over bridges, into brush at 45 degree angles, following the forest terrain and did what it took to reach to the “R” gorillas. Momma and her precious little one. 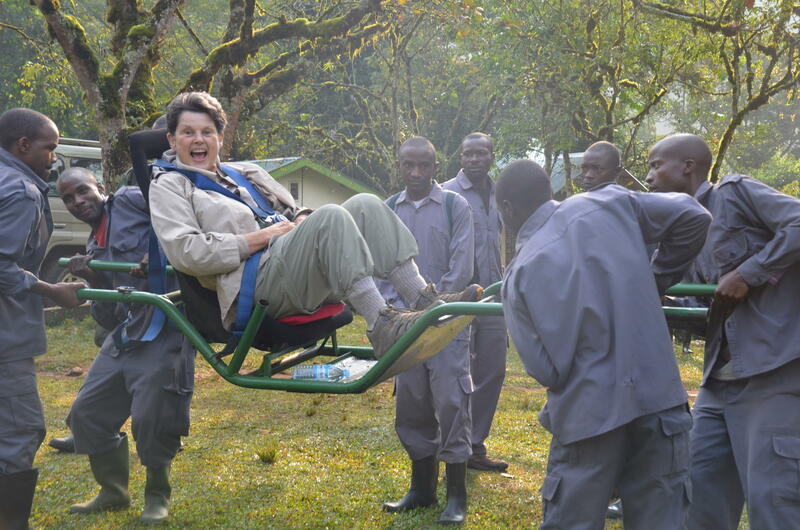 At Volcanoes National Park in Rwanda, the handicap method was also used but a stretcher basket this time took me right to the first gorillas group in the mountains. 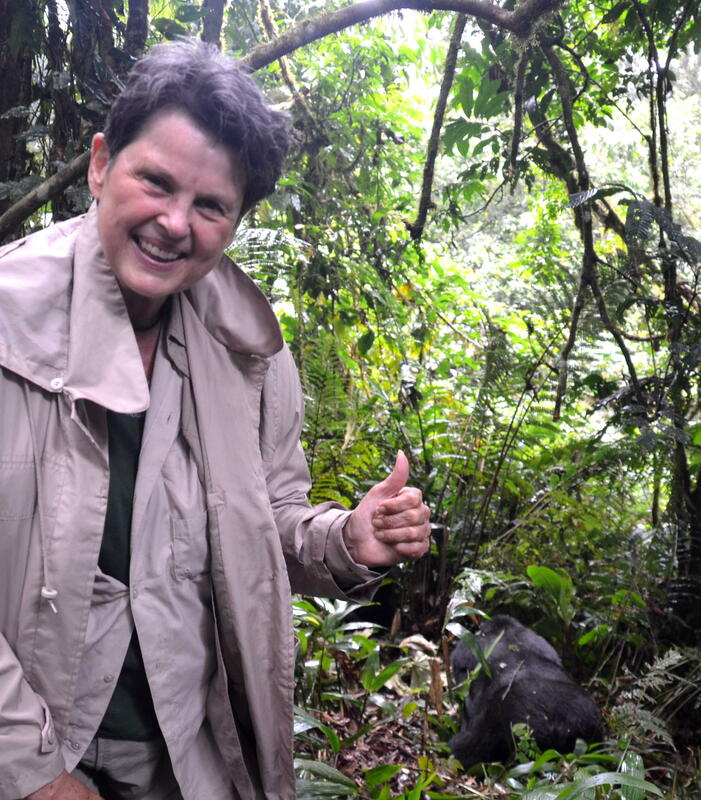 The wonderful handicap service has an extra fee in both parks but it allowed me to enjoy the mountain gorillas in the wild with the other 7 persons allowed to visit that troop that day. Eating breakfast in a another location in the dense forest vegetation. Arriving to where our troop was at each park took 30 minutes to 1 hour and then I walked on the level ground, took photos and enjoyed the gorillas. And enjoy, I did. 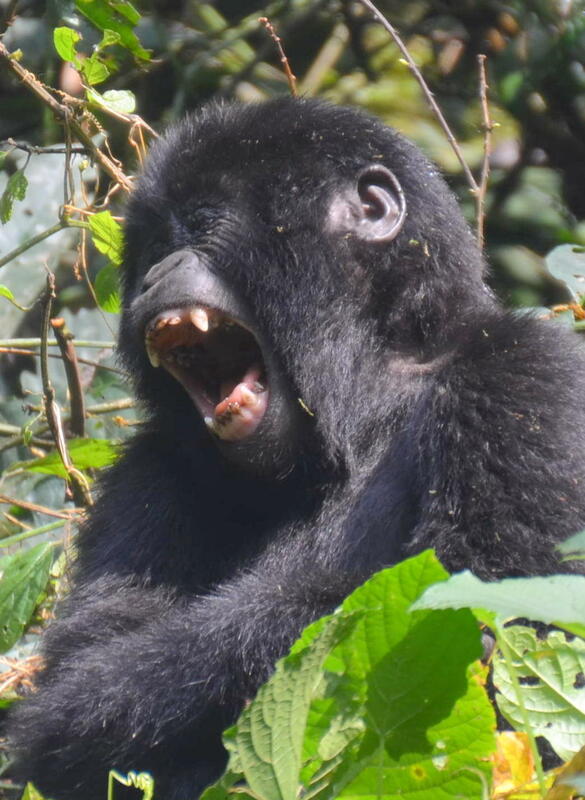 It was worth every penny spent to see 24 gorillas in Bwindi and 18 gorillas in Volcanoes of the remaining 800 severely endangered mountain gorillas in the wild. When the troop members knuckle-walked through the dense vegetation, I moved with them and our group with a personal porter who carried my backpack and helped me through the thick vegetation so I wouldn’t fall. 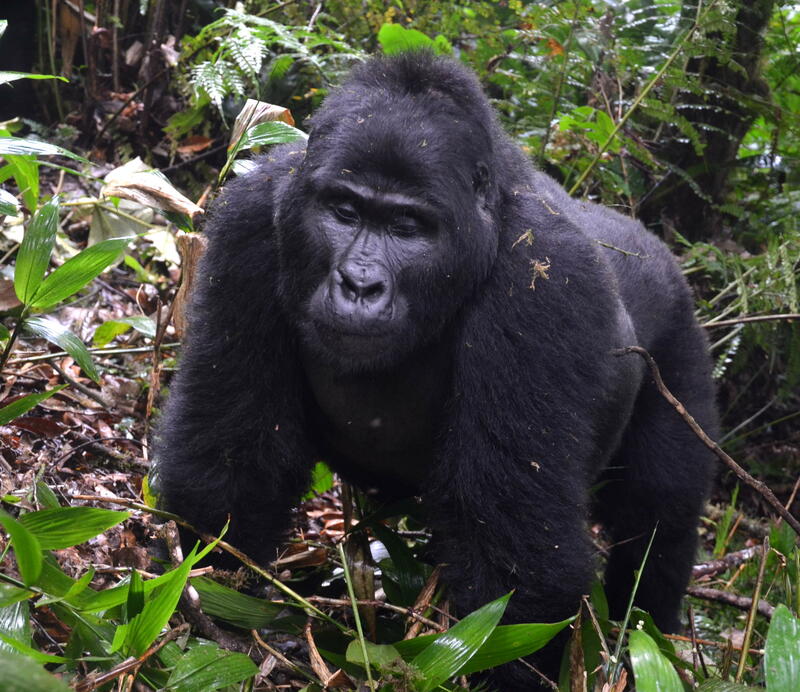 Romping, rolling, grunting, barking, biting, and chest beating with another teenage gorilla. This little one slapped me. Look at those teeth! 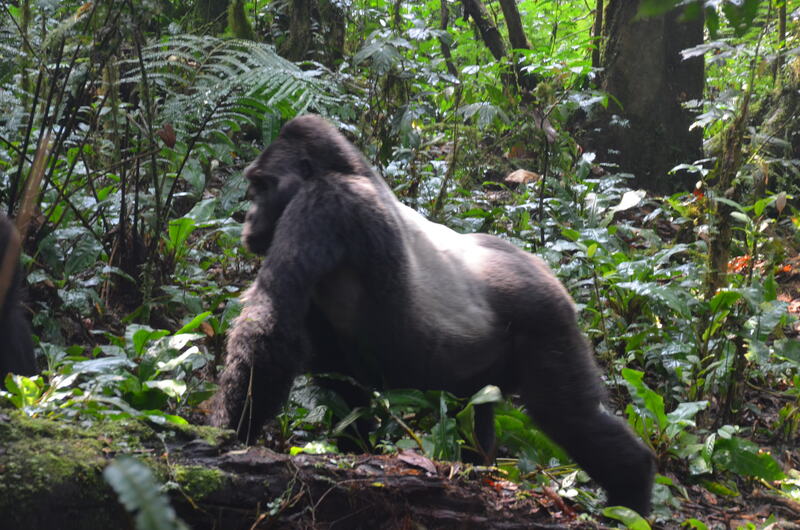 It was while I was taking photos of a young juvenile gorilla in Volcanoes National Park that he/she suddenly walked up to me and slapped the right chin of my leg. It was just a baby slap and didn’t hurt but it was a surprise because one gorilla actually touched me!! One of our 4 trackers said he just wanted to play with me. But he went right back to where he had been sitting. So I didn’t try to play with him The troops we visited were habituated to humans, yet they live up in the mountain and are free roaming. I wasn’t scared one minute while viewing them because they were so awesome and cute. Knuckle walking through the forest to another site for breakfast. 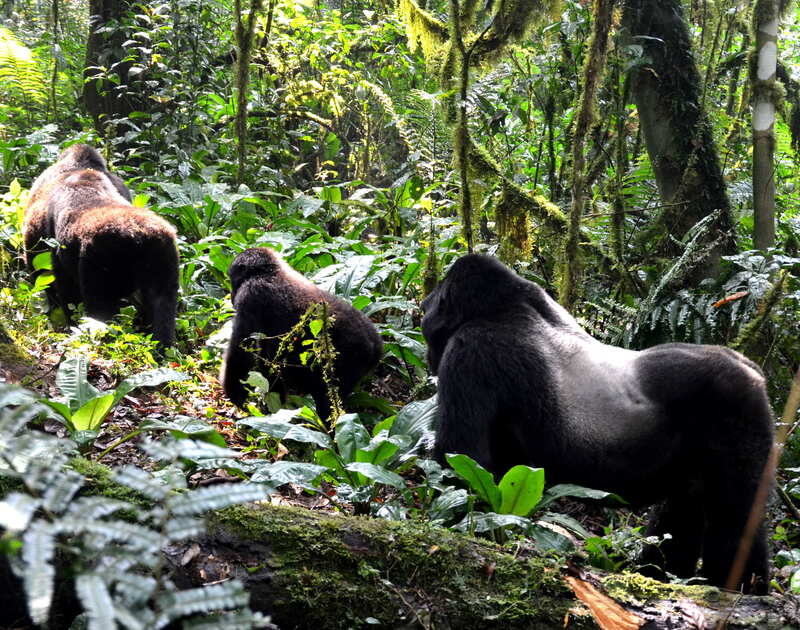 At Bwindi Impenetrable Forest, the “R”, 24 member-troop moved by knuckle walking only once after coming down one at a time from the Fig Tree where they were eating leaves for breakfast. 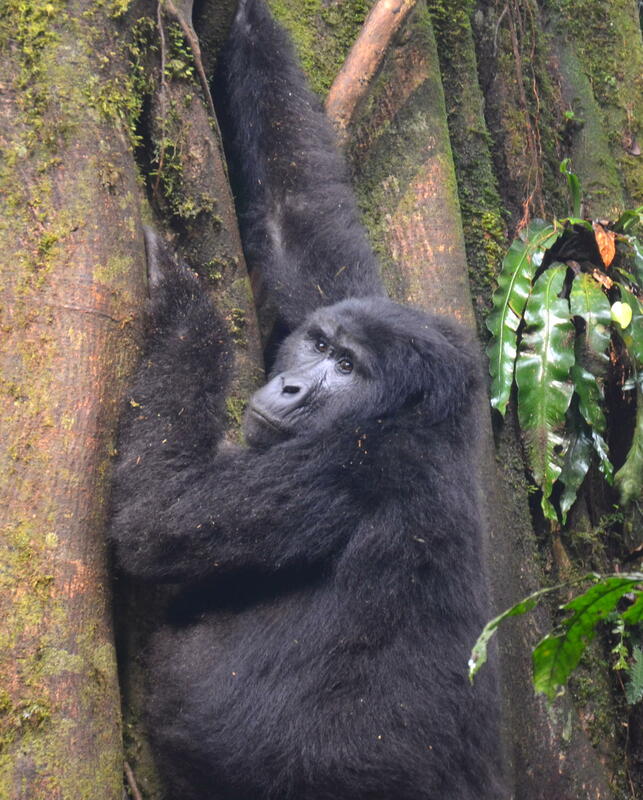 It took 30 minutes to reach the tree from the camp and we stood and watched them eat for 30 minutes. 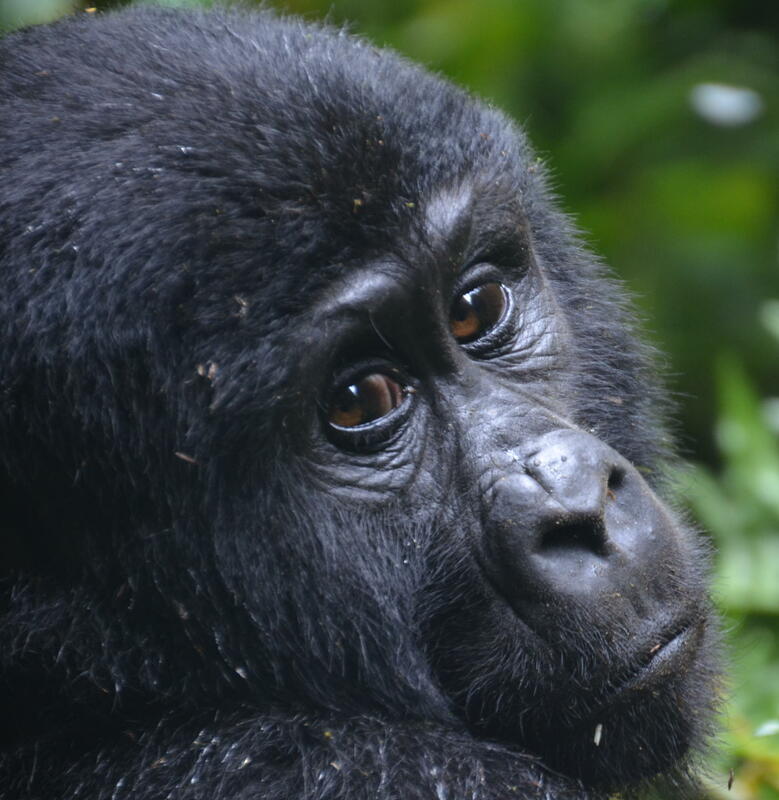 The one hour time limit began once the gorillas were all on the ground. 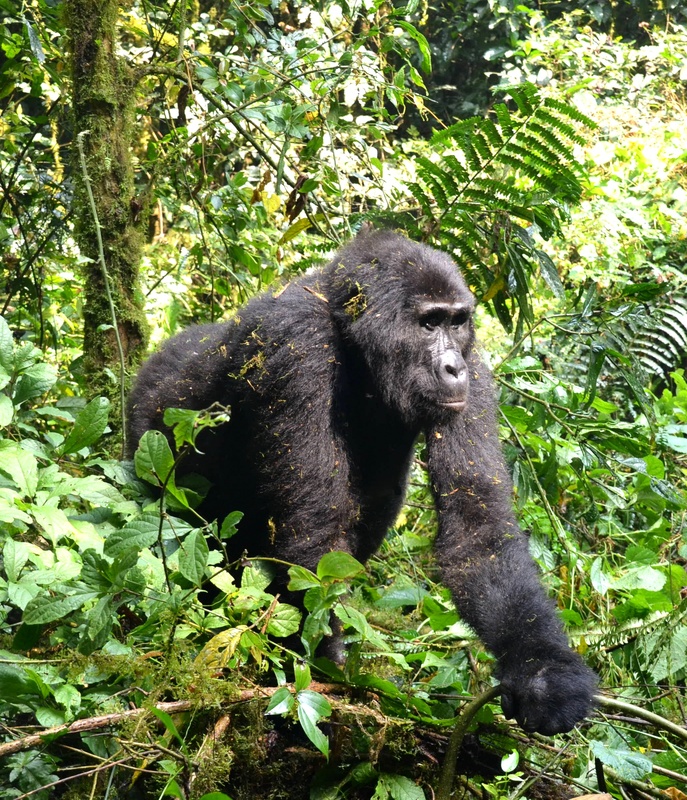 The first gorilla down from the tree in Bwindi was a younger member of the troop who decided to walk right between June and me. 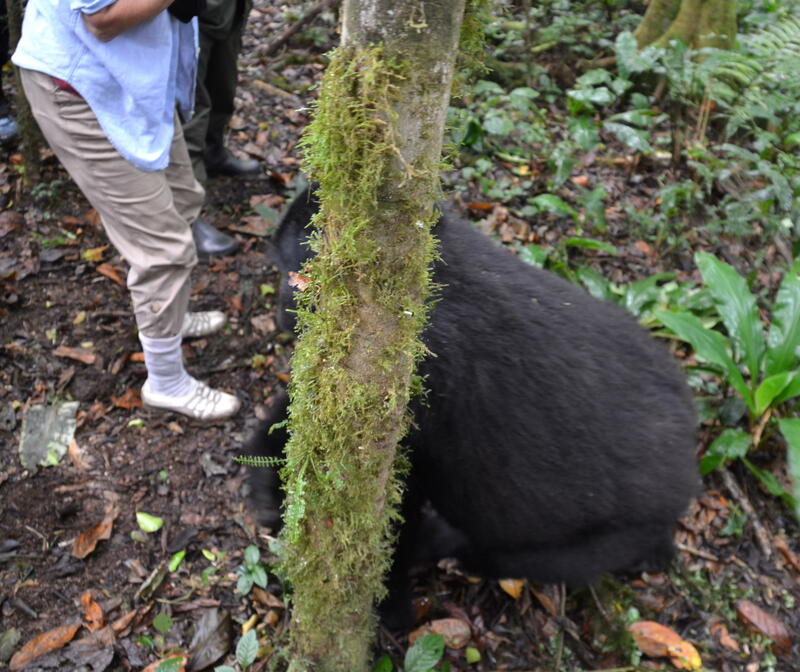 We were surprised that we could get inches from a gorilla because we were told to stay 15 meters from them and do not touch them. T hat gorilla walked right between us like we weren’t even there and continued on beyond us nonstop. The Silver Back babysitting his youngest offspring. Priceless! The first one down from the Fig Tree knuckle walked right between June and me and acted like we were not there. 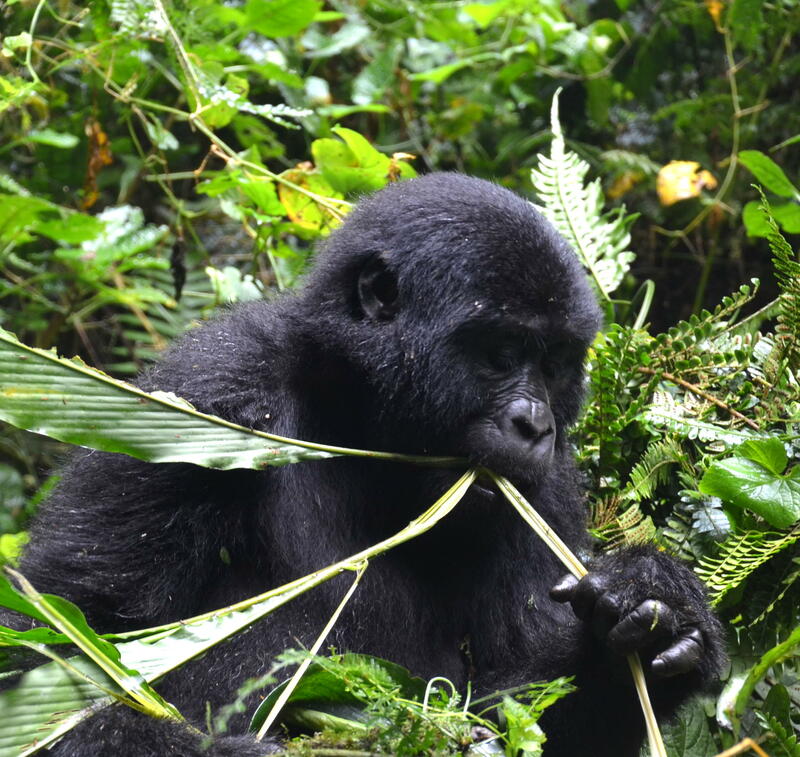 Photo taking was excellent in Bwindi because the gorillas remained in one place, the sun was shining and they were still eating vegetation. 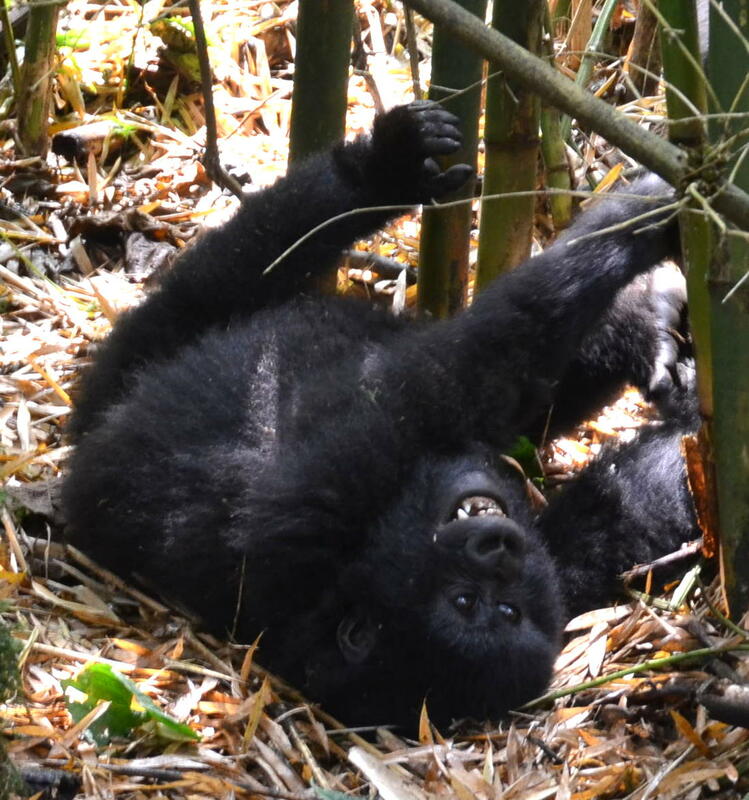 It was more difficult to take photos in Volcanoes as the young troop members were all playing, biting each other, chest beating, rolling and play fighting, swinging and nursing, plus the vegetation was all around them making it difficult to get a clear photo of the gorillas. Mother nurses her little one until 21 months old. Notice her right hand caressing the baby’s neck and back. Seeing a Mother nursing her baby in Volcanoes was the highlight of the trek for me. 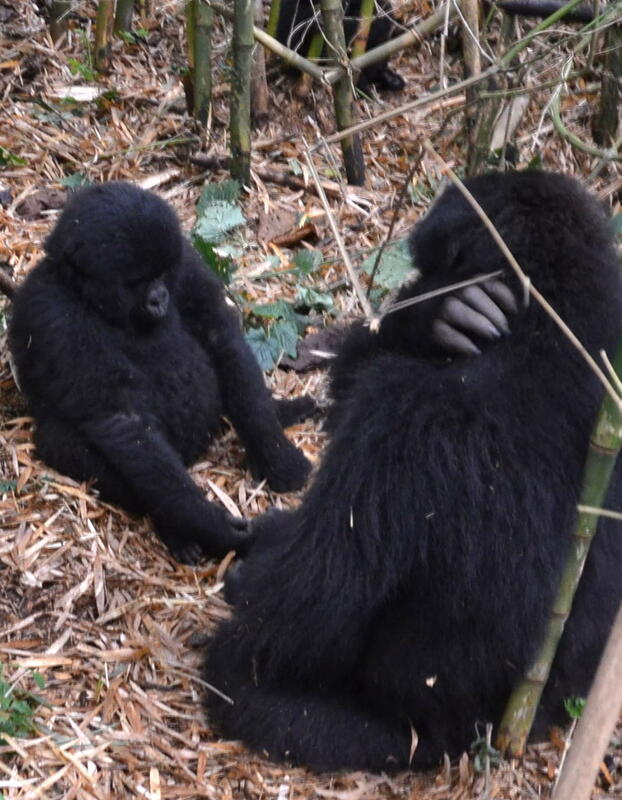 Having seen many animal mothers nursing their babies, I didn’t expect to see the Mother Gorilla caressing, petting, stroking and rubbing her baby’s head and back while it nursed. 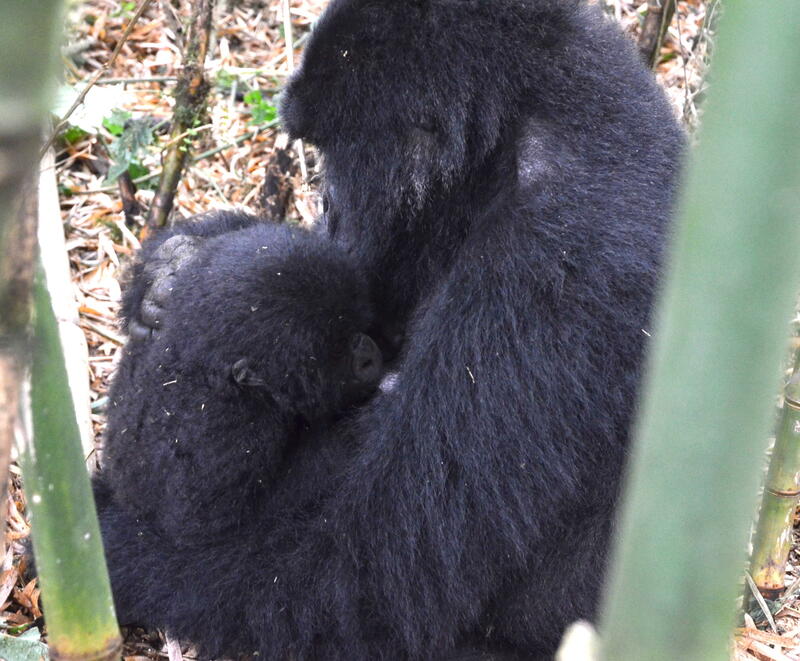 It was such a tender, precious moment that really made me see that gorillas are 98% human DNA and so much like us. 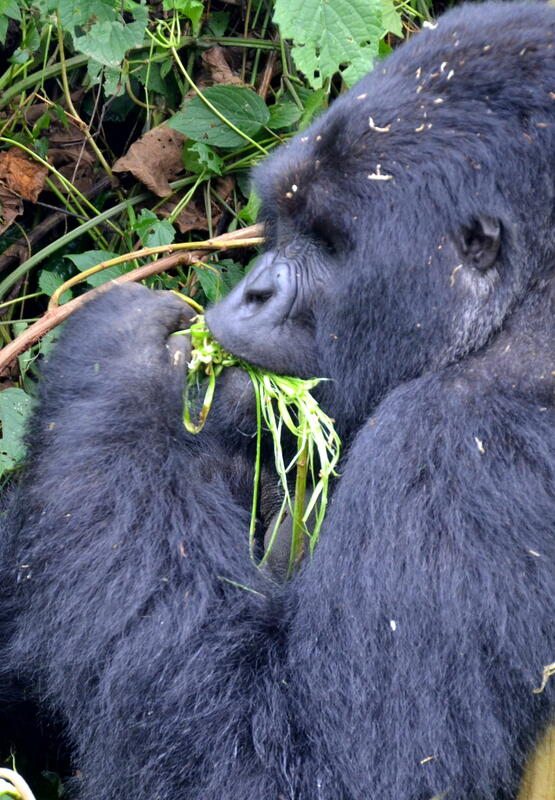 After the nursing, we changed locations to see another silverback in full view eating vegetation in the sun in Volcanoes. 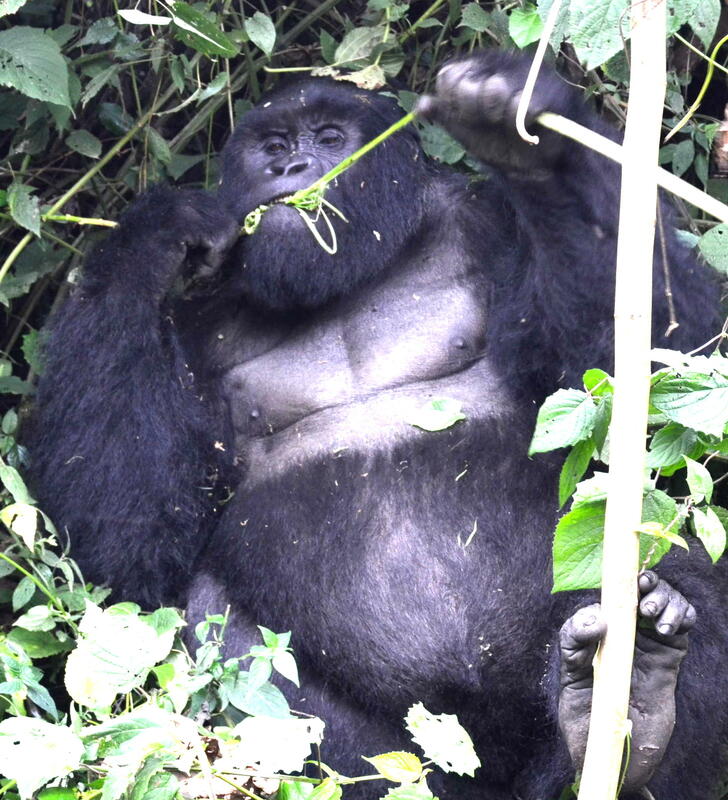 This ruling silverback of the troop weighed 200 kilos or 440 pounds, our Park Ranger told us. He was huge and the size of a human. Our one hour viewing was up in Volcanoes National Park and on the way to my basket stretcher my porter with a machete helped me negotiate the dense vines and vegetation. Suddenly, he said to me “there is a gorilla right beside us,” and I looked and there it was. I was so surprised I stumbled and fell to the ground like I was sitting down and continued into a back roll which helped make the fall painless and easy without injury. Off we go through the Irish Potato fields to the base camp where it all began. 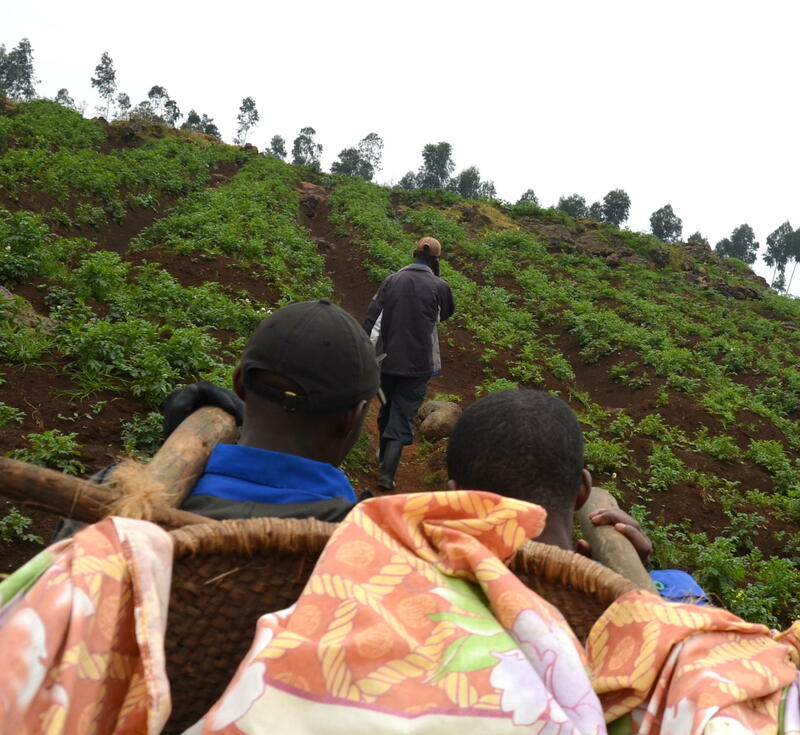 Getting up quickly, we continued on to the basket stretcher and down the mountain through a potato field full of people harvesting Irish potatoes by hand to the base point where it all began. We were so happy that we had used Bestway Safaris and Tours www.bestway.co to put this tour together for us because it was excellent and a dream come true. Our guide was Emmy Maseruka of http://www.afrikanwildlife.com. 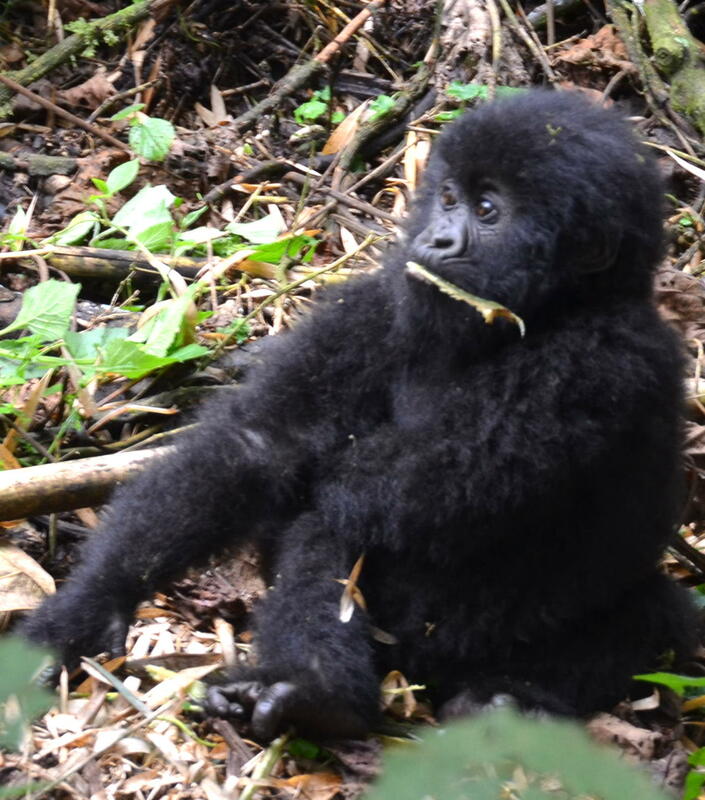 The final gorilla trek was over but not the memory of those furry and bushy haired black mountain gorillas. 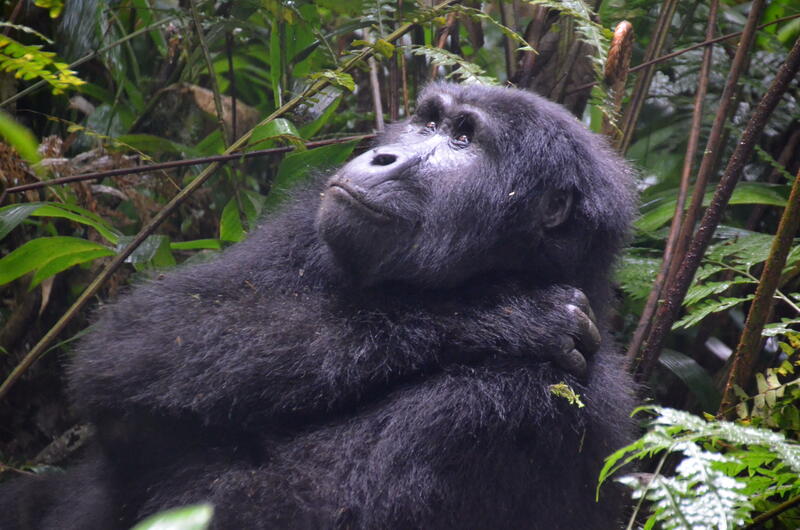 Hopefully, their enemies-the leopard, Ebola virus and other illnesses, forest clearing and poaching-will not destroy them so they can be removed from the severely endangered list soon and still be able to live in the wild in the Uganda and Rwanda mountains for the entire world to enjoy like I did. 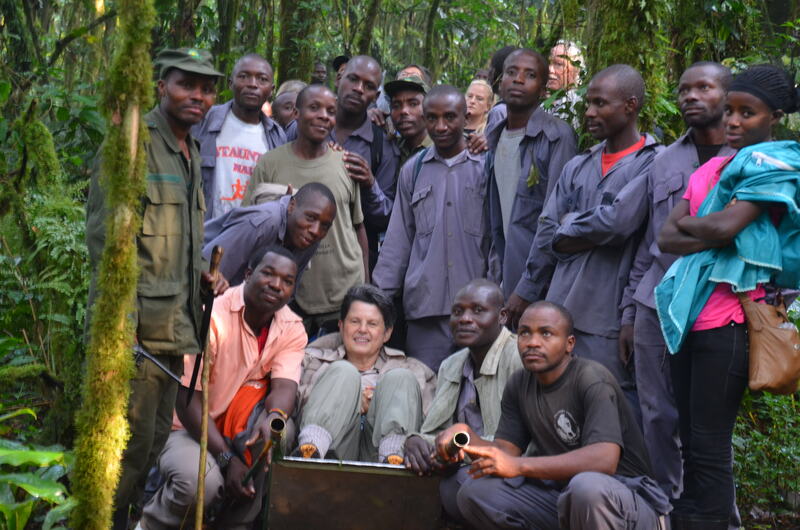 The wonderful porters who helped all 8 of us in our trekking group in Bwindi Impenetrable Forest in Uganda. Our trek would not have been successful without them. The Black Back was wanting to mate with the female but he was very cautious because if the silver Back found out, he would be in grave danger for his life. So he did not mate this time. 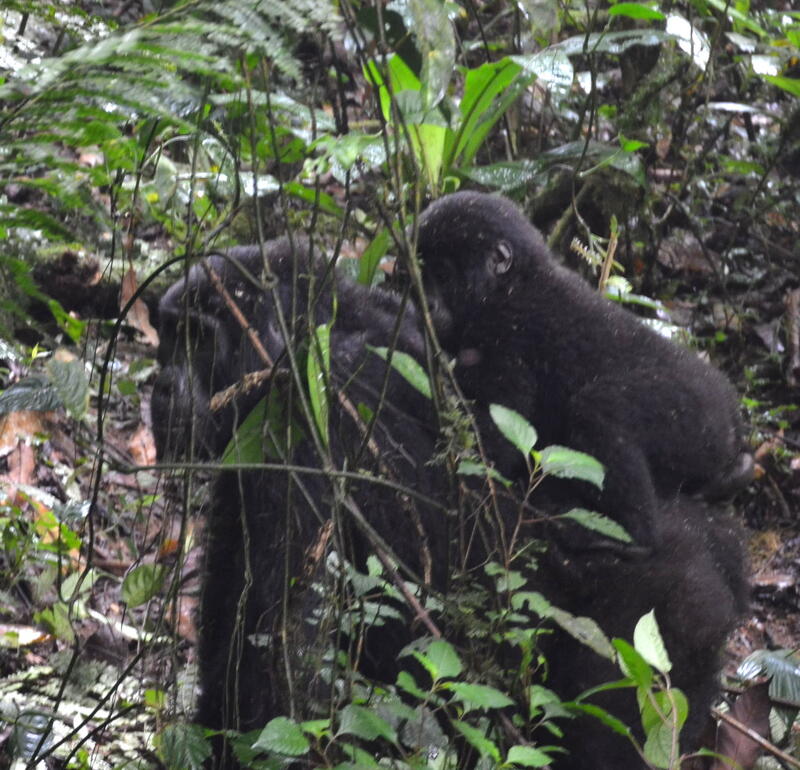 Juvenile gorilla riding it’s Mother’s back through the forest.